Before there was a civil war and before Syria became the world’s chessboard, there was a peaceful uprising for freedom and dignity. Forty-five days after Mohamed Bouazizi’s fateful self-immolation in the sleepy Tunisian town of Sidi Bouzid, as more than 250,000 gathered in Tahrir Square to demand the fall of the Mubarak regime, Syrian President Bashar al-Assad sat down for a rare interview with The Wall Street Journal. “Is there any concern that what is happening in Egypt could infect Syria?” he was asked. Assad was confident it could not. Less than two months after this smug, if not deluded, assessment, a group of Syrian children in the southern town of Dara’a, inspired by an unprecedented political awakening in the region, decided to express their solidarity by painting the mantra of the Arab Spring on their school wall: Al sha’ab yureed isqat al nitham—“The people demand the fall of the regime.” From Libya and Egypt to Yemen and Tunisia, this chant rocked the seemingly immovable foundations of decades-old autocracies. Now it was Assad’s turn. Within days, these children were rounded up and tortured. When their parents protested their detention to the local authorities, the police chief, who happened to be none other than Assad’s cousin, told them to forget about their kids and “make other ones.” If this was not satisfactory, he had a suggestion: “Bring us your wives, and we will make children for you.” This humiliation sparked the first wave of protests, which Assad’s security forces were instructed to put down with live ammunition. As the death toll steadily rose from dozens to hundreds to thousands, the demonstrations spread across the country, from town to town, city to city. Week after week, month after month, unarmed protesters peacefully faced down Assad’s murderous, sectarian thugs. “Selmia, selmia”…“peaceful, peaceful” they can be heard chanting in dozens of still accessible but forgotten YouTube videos, just before their cries are drowned out by a barrage of bullets. As the international community, led by Russia and the United States, continues to debate how to enforce an international norm against chemical weapons without becoming entangled in a sectarian civil war, it is worth looking back to those more innocent days. It seems the world has forgotten that before it was sectarian, it was about equality for all. Before there was Jabhat al-Nusra, there were defectors who refused to fire on innocent civilians. Before 100,000 people died, 500,000 gathered in Hama’s al-Assi Square for a nonviolent protest. Before there was a civil war and before Syria became the world’s chessboard, there was a peaceful uprising for freedom and dignity. It was Assad who chose to torture, murder and carpet-bomb his way to the sectarian abyss in which Syria now finds itself. It was Assad who knowingly stoked historical tensions to cement the perception that dictatorship was the only way to defend Syria from medieval radicals who will drive out the country’s vulnerable minorities. For two and a half years, the world huffed and puffed, but did little else, as Assad’s barbarism created the perfect storm for Al Qaeda’s resurgence. For two and a half years, helpless Syrians waited for the intransigent UN Security Council to finally do its job. That moment never arrived. As a Syrian-American, I’ve been profoundly moved by the events of the past two and a half years. Like many observers of the Arab Awakening, I was inspired and brimming with hope at the outset. This optimism quickly gave way to outrage as the dead bodies piled up. Outrage was eventually replaced with utter resignation—resignation to the murder, looting and destruction that is now carried out with merciless impunity on all sides; resignation to the fact that the world’s powers are more interested in exploiting the conflict for their own geopolitical gains than they are in applying diplomatic pressure to put a halt to it; resignation to the reality that Syria as I grew to know it may no longer exist. Like many Syrians living in the West, I spent most of my summers in Syria as I was growing up. It was during these extended visits that I was enchanted by this ancient land, which sits at the heart of the Fertile Crescent, the cradle of civilization. I will never forget the breathtaking view of Damascus from Mount Qasioun, once a popular place to have dinner overlooking the city, now a launching pad for Scud missiles and other indiscriminate vectors of destruction. I can still taste the unparalleled shawarma and hear the penetrating sound of the azhan, incongruously blaring from dozens of minarets, now probably occupied by snipers. There are no words that could do justice to the formative nature of walking the dusty, stone halls of the Krak des Chevaliers, one of the best-preserved Crusade-era castles in the world, or meditating in the serene courtyard of the Umayyad Mosque as I waited for the sun to rise. I was always proud of Syria’s religious harmony, its ancient churches and mosques sitting side by side across the country. It’s all a faint, distant memory now. Tragically, Syria’s timeless treasures have not been spared the savagery of this war. The Krak des Chevaliers was shelled by the government after rebels sought refuge behind its formidable walls. Aleppo’s ancient souk, described by UNESCO Director General Irina Bokova as a “crossroads of cultures since the second millennium BC,” was burned to the ground. Reports of a black market for priceless antiquities suggest looters have taken advantage of the turmoil to rob the country of its storied history, piece by piece. From Palmyra to Bosra, there have been innumerable reports of damage to millennia-old ruins, many of which are among Syria’s six UNESCO World Heritage sites. The Ancient City of Aleppo, the historic city center of Syria’s most populous city, is one of these sites. Like most of the country, there’s not much left of it. Though parts of Damascus, Syria’s capital, have survived the war relatively unscathed up to this point, the destruction is inching closer. Barring a miraculous cessation of violence, it’s only a matter of time before the city’s remaining handful of neighborhoods suffer the same harrowing fate as the rest of the country. To Damascus, years are only moments, decades are only flitting trifles of time. She measures time, not by days and months and years, but by the empires she has seen rise, and prosper and crumble to ruin. She is a type of immortality. Maybe Mark Twain was wrong. Maybe she’s not immortal, after all. 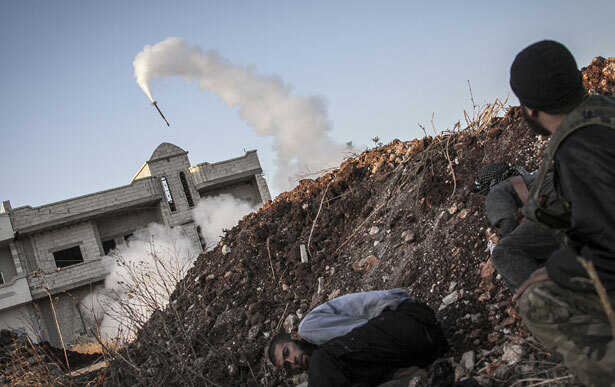 Barbara Crossette’s deep dive into the UN Security Council resolution on Syria.